For the homonymous opening track of the album, see Tarkus (song). Tarkus is the second studio album by the English progressive rock band Emerson, Lake & Palmer, released in June 1971 on Island Records. Following their 1970 European tour, the group returned to Advision Studios in London, in January 1971 to prepare material for a new album. The first side is the seven-part "Tarkus", with a collection of shorter tracks on side two. Tarkus went to number one in the UK Albums Chart, peaked at number 9 in the US, and reached number 12 in Canada on two occasions totaling 4 weeks. Emerson, Lake & Palmer began to work on their second studio album in January 1971. The "Tarkus" suite caused tensions within the band—Lake objected to the music Emerson was developing and nearly left the group over it; one of the band's managers persuaded him to stay. He eventually came to see the work's value, and even contributed the "Battlefield section". "Tarkus" is a suite in seven parts—one of the earliest multipart progressive-rock suites. The recorded version lasts nearly 21 minutes and takes up a full side of the album. The odd-numbered sections are instrumentals, and the even-numbered ones vocal tracks. It is a concept piece whose concept is gleaned not from the music and lyrics alone, but also from the album artwork and the section titles; nevertheless the concept and narrative remain ambiguous and open to interpretation. The second side of the album is made up of short songs unrelated to "Tarkus" or to each other. William Neal made the artwork for the album's cover and gatefold. 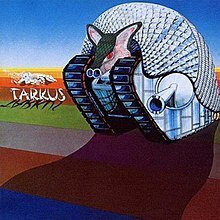 The cover image of a giant Armadillo on tank treads has become an iconic image in progressive rock. Emerson said, "To everyone, it represented what we were doing in that studio. The next day on my drive up from Sussex the imagery of the armadillo kept hitting me. It had to have a name. Something guttural. It had to begin with the letter 'T' and end with a flourish. "Tarka the Otter" may have come into it, but this armadillo needed a science fiction kind of name that represented Charles Darwin's theory of evolution in reverse. Some mutilation of the species caused by radiation ... 'Tarkus'!" The gatefold presents eleven panels that illustrate the events of "Tarkus". It begins with an erupting volcano, below which Tarkus emerges from an egg. Tarkus faces a number of cybernetic creatures, culminating in a battle against the Manticore. The Manticore stings Tarkus's eye, and Tarkus retreats bleeding into a river. Tarkus was released on 14 June 1971 in the UK on Island Records, appearing two months later in the US by Atlantic Records' subsidiary label Cotillion Records. It is one of only two ELP studio albums to reach the Top 10 in the States, making it to No. 9 (Trilogy, the following year, got to No. 5), while in Britain it is their only number-one album. Additionally, Tarkus spent a total of 17 weeks in the UK Albums Chart. In Japan the album was released on Atlantic Records. Later vinyl reissues were on the Manticore label. Tarkus was certified gold in the United States shortly after its release on 26 August 1971. In 1993, the album was first digitally remastered by Joseph M. Palmaccio at PolyGram Studios. This remastered version was released by Victory Music in Europe and Rhino Records in North America. Mobile Fidelity Sound Lab issued Anadisq 200 Series LP (MFSL-1-203) and Gold CD UltraDisc II (UDCD 598) remasters in 1994. These items are currently out of print. In May 2012, Steven Wilson announced that he had recently remixed two classic albums by ELP, their first (eponymous) album from 1970 and second album Tarkus from 1971. Both albums were subsequently released by Sony 27 August 2012 as 3-disc sets. In each case disc one is a CD of the original mix (duplicating the Palmaccio master), disc two is a CD of the stereo remix in the form of an alternate version of the album, adding a lot of bonus material and previously undiscovered tracks recorded during the sessions. Disc 3 is a DVD-Audio containing lossless 5.1 surround sound mixes and high resolution versions of the 2012 stereo mixes. Tarkus received generally unfavourable reviews from critics, such as David Lebin in Rolling Stone who wrote: "Tarkus records the failure of three performers to become creators. Regardless of how fast and how many styles they can play. Emerson, Lake and Palmer will continue turning out mediocrity like Tarkus until they discover what, if anything, it is that they must say on their own and for themselves." François Couture in a retrospective review for AllMusic feels that Tarkus is "a very solid album, especially to the ears of prog rock fans – no Greg Lake acoustic ballads, no lengthy jazz interludes". Couture concluded, "More accomplished than the trio's first album, but not quite as polished as Brain Salad Surgery, Tarkus is nevertheless a must-have." Emerson admitted that Tarkus was one of his favourite albums, "not least because the title track has taken on a life of its own". All lyrics written by Greg Lake. "The Only Way (Hymn)": Themes used in intro. and bridge only – Toccata in F and Prelude and Fugue VI, Bach. Although not credited, the music to "Are You Ready, Eddy?" was largely inspired by Bobby Troup's 1956 song "The Girl Can't Help It". In his 2004 autobiography Pictures of an Exhibitionist, Keith Emerson refers to the track as "an impromptu jam" played in celebration of completing work on Tarkus. ^ "Tarkus page on the Emerson, Lake & Palmer official website". ^ Macan, Edward (1997). Rocking the Classics: English Progressive Rock and the Counterculture. Oxford University Press. p. 116. ISBN 9780199880096. ^ Dome, Malcolm (2011). "Emerson, Lake & Palmer's Tarkus". Classic Rock Presents Prog (17): 74. ^ a b Macan 1997, p. 87. ^ a b Macan 1997, p. 88. ^ Dome, Malcolm (2011). "Emerson, Lake & Palmer's Tarkus". Classic Rock Presents Prog (17): 76. ^ a b c Dome, Malcolm (2011). "Emerson, Lake & Palmer's Tarkus". Classic Rock Presents Prog (17): 77. 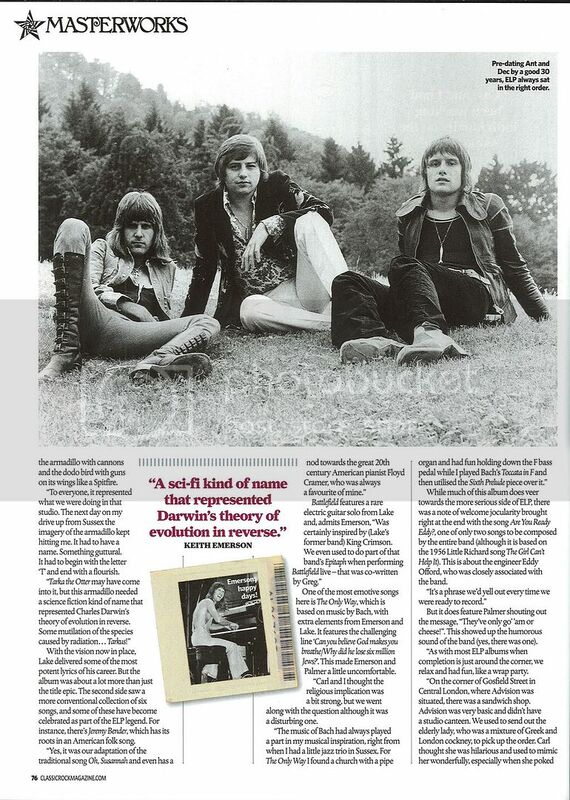 ^ a b "Emerson, Lake & Palmer chart positions in the UK". The Official Charts Company. Archived from the original on 9 November 2014. ^ a b "RIAA's Gold & Platinum Program searchable database". Recording Industry Association of America. Archived from the original on 2 September 2008. ^ "Mobile Fidelity Sound Lab complete Gold CD UltraDisc and UltraDisc II discography". ^ "Mobile Fidelity Sound Lab album discography". ^ "Emerson Lake & Palmer - TARKUS [DVD-A]". ^ David Lebin (19 August 1971). 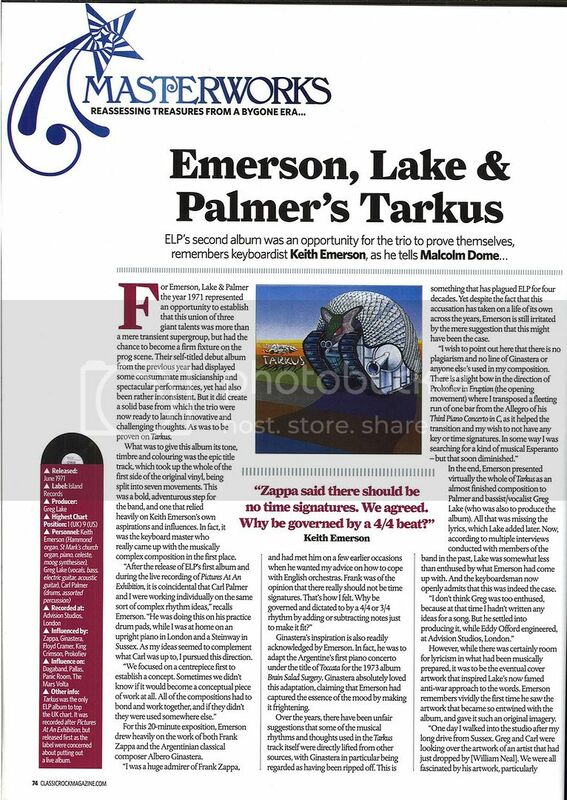 "Emerson, Lake & Palmer: Tarkus : Music Reviews". Rolling Stone. Archived from the original on 10 November 2007. ^ "Tarkus - Emerson, Lake & Palmer - Songs, Reviews, Credits - AllMusic". AllMusic. ^ Mettler, Mike. "ELP Reissue Series: Emerson, Lake & Palmer; Tarkus; Pictures at an Exhibition". soundandvision.com. Retrieved 28 January 2019. ^ Haugen, Tom (2019). 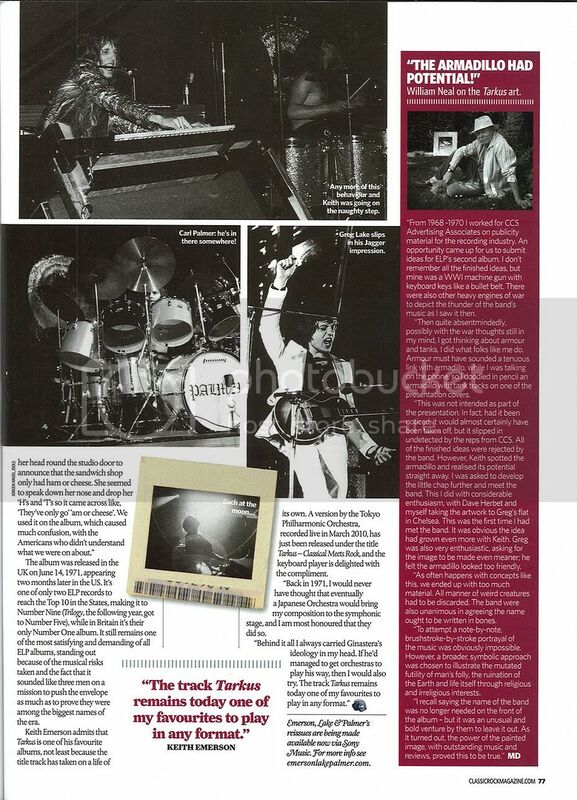 "The Daily Vault Music Reviews : Tarkus (Deluxe Edition)". dailyvault.com. Retrieved 28 January 2019. ^ Pardo, Pete. "Emerson Lake & Palmer: Tarkus (remastered/remixed)". Sea of Tranquility. Retrieved 3 December 2018. ^ François Couture. "Tarkus - Emerson, Lake & Palmer". AllMusic. ^ Emerson, Keith (2004). Pictures of an Exhibitionist, John Blake Publishing Ltd., ISBN 1-84454-053-7, p. 205. ^ Tarkus (Media notes). Island Records. 1971. ILPS 9155. ^ "Tarkus chart position in the US". Billboard. ^ "RPM Top 100 Albums - July 31, 1971" (PDF). Macan, Edward (1997). Rocking the Classics: English Progressive Rock and the Counterculture. Oxford University Press. ISBN 978-0-19-535681-6. Ford, Peter T. (August 1994). The Compositional Style of Keith Emerson in Tarkus (1971) for the Rock Music Trio Emerson Lake and Palmer (M.A.). Indiana State University. OCLC 812040625. Retrieved 7 January 2015.